Foreword. Preface. The Solubility of Gases in Liquids. Carbon Monoxide Solubilities. Water. Sea-water. Salt solutions (aqueous). Salt solutions (non-aqueous). Organic solvents and water. Saturated and unsaturated hydrocarbons. Cyclic hydrocarbons. Aromatic hydrocarbons. Alcohols. Ketones, acids, esters, ethers. Organic compounds containing halogen. Organic compounds containing sulphur. Organic compounds containing nitrogen. Biological fluids. Miscellaneous fluids. System Index. Registry Number Index. Author Index. Solubility Data Series: Published and Forthcoming Volumes. 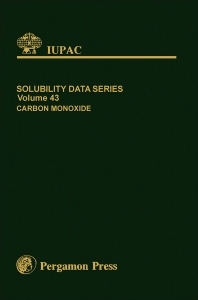 This volume in the Solubility Data Series contains tabulated collections and critical evaluations of original data for the solubility of carbon monoxide in a variety of liquid solvents. The solvents include water, aqueous and non-aqueous salt solutions, a variety of hydrocarbons, a variety of oxygen-containing, halogen-containing, sulfur-containing, and nitrogen-containing organic compounds, and also some biological fluids with which carbon monoxide has an important interaction. The data were gathered from a search of the world's chemical literature through to the end of 1988, and make up a unique and valuable historical survey of the solubility of carbon monoxide. Their publication is timely in view of current concern about carbon monoxide as an atmospheric pollutant, and in view of the role which carbon monoxide is likely to play in the future, as chemical feedstocks may have to change in response to supply and demand patterns, and as alternative energy sources are developed, especially coal gasification technology. For all of these applications, and for numerous others, this volume of well documented and critically evaluated gas solubility data will be of tremendous benefit. For researchers and scientists involved in the use of carbon monoxide. This is a very good source of hard data and references on the solubility of CO in liquids. It is otherwise very hard to get these data from literature and this comprehensive book covers it all. The only drawback is, that there are so many different ways on reporting solubilities and all randomly used throughout the book, so if you need to compare some of them, you need to recalculate yourself. Otherwise this is very valuable source to me and my research.